First thing’s first; You’ll need a bag of treats. Something they like and also be sure they’re hungry. I’d even recommend working them for their diet with this one. Second you’re gonna attach them to a leash. You know what I always say about my 3 rules of training: Control, Train, Treat. It’s the foundation of my training. We cannot train until we have control. A leash is usually the simplest and most effective form of control. Now hold that leash in your hand while training this technique. This will not only make things easier for you but it’ll keep your dog in a steady position while training. Next you’re gonna need to teach your dog to bark on command. Let’s call it a “Speak” command. This isn’t too difficult with excessive barkers. All you need to know is what triggers them off and you can teach them in a matter of minutes. A knock or a doorbell is a common one. Here’s how we do this: Go to the door and crack it open just enough where your arm can either ring the doorbell or knock. Ring the doorbell and or knock on the door. Your dog will instantly start barking. From there you’re going to stand between them and the door and give a “Speak” command while giving a hand signal. Make your hand signal something distinctive like your pointer finger waiving left and right in the air. While your dog is barking give them a treat but don’t praise them. 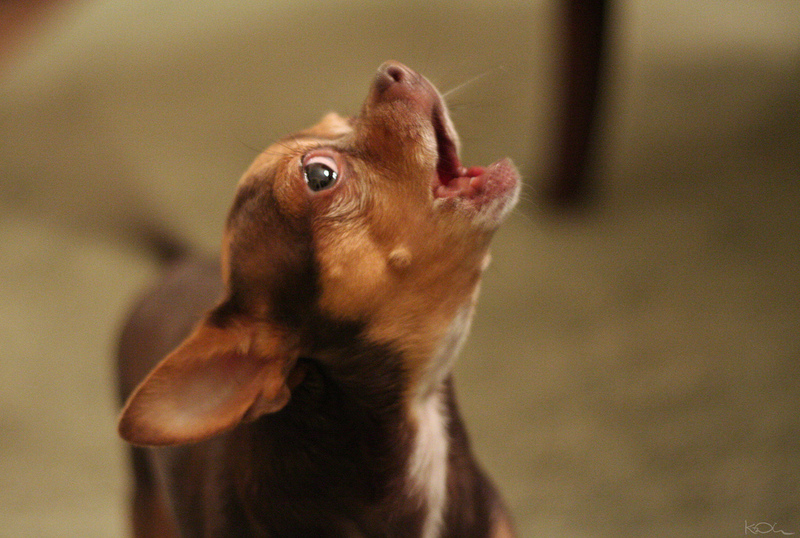 By now your dog should be responding to the “Speak” command on cue with no doorbell/knock. Most dogs pick it up within an hour or so. Some sooner, some might take a while to get it. It’s vital to make sure they grasp the “Speak” command before moving on in the process. Go ahead and give the “Speak” command with the hand signal. As your dog begins to bark I want you to now give a “Quiet” command. Be sure to not yell it, just firmly say it. You’ve taught your dog to bark on cue so it’s a controlled bark. This will make it easier for them to stop when you give the “Quiet” command. If they keep barking just wait them out till they stop. Trust me they’ll stop much quicker with the trained “Speak” command. Once they’ve stopped barking wait a couple seconds then pay them. It’s very important to wait these couple seconds afterwards because this will teach the dog that they’re getting paid for being quiet, not for barking. Everyday try and add a second or two of silence before you pay them. Within a week you should be up to a good 10-15 seconds. You’re gonna repeat this process several times a day for a week. This will lock it in their memory bank for good. The more you do this the better they’ll get at the quiet command. When the doorbell rings they’ll most likely start barking again but now you have a command to combat that unwanted behavior. It’s a little trickier with a doorbell and it won’t go as seamlessly but it’ll definitely be a huge help and make the problem at least 80% better. Some dogs will take much longer as their habit is often ingrained into their system but patience wins the game in training. As always the details are what make any training technique so effective. First of all having a dog well trained in basic obedience makes this process much easier. If you have a dog that’s out of control in all areas this might be a tough one for them. Also don’t spend more than 10-15 minute sessions training this. Take breaks after 15 minutes and pick it up again in an hour or two. Overtraining is never good for a dog. In my experience dogs learn much better with short sessions every couple hours rather than long sessions once a day. Also be sure once they begin to really grasp the technique to slowly ween them off of the treats. Once they’re keeping quiet every time you give the command I want you to reward them with a treat 4 of 5 times making sure the last one of the 5 is always rewarded. This ends it on a positive note and they’ll wanna do it again next time. Then a few days later 3 of 5, and so on and so forth till the treats are out of the equation and it’s a trained behavior for the dog. Also don’t yell the “Quiet” command. You don’t wanna get into the game of having to raise your voice every time you ask your animal to do something. This is always the most difficult part for people because they want instant silence when they train this. The first few sessions it might take your dog 20 seconds or longer to quiet down. This is the game of patience when training. Wait them out and that 20 seconds will turn into 2 seconds in no time at all. Keep a steady head and take your time. Try it out with your dog and let me know how it goes. Ruff. When you have them on the leash by the door to start the speak exercise, do you have them in a down or sit and stay? Hi, we have a Schnauzer that barks at everything, animals in the yard, wind blowing leaves, doorbells, etc. We taught him speak when he was just a puppy. So he does that already on command. How would we do quiet now? Also how do you break marking, perhaps you can write an article about it. We have tried everything. He is 9 years old now. have you thought of giving hug I do that with my snauzer when he greets me at door I grab him tight on underarms and he is good and accepts my hug then he runs into house after that. Hey Brandon, thank you for this great article. I currently have a golden retriever at home that would not stop barking to the extent that my neighbors have lodged a complaint to the authorities. I googled for tips and tried a lot of methods but still, my goldie’s barking problem was never resolved. Do you think it’s more than just bad behavior? I mean, could it be some deep psychological issue? I’m worried that the authorities might take away my dog which would be every dog owners nightmare. I’m that desperate to the point that I thought of hiring a dog specialist, however, after checking their rates, I know I can’t afford them. While browsing to Google, I also came across brain training for dogs on https://lovingfrenchies.com/brain-training-for-dogs-review/. I’m very skeptical because it’s a digital product and it seems like they are over-promising the results. Have you heard of this the product and do you think it’s recommended for a person in my current situation? Hope to hear your thoughts soon Brandon. Thank you so much once again. Hello. I also have a Schnauzer that we have had for 5 yrs now. He is 5 and 1/2 yrs old, We started out teaching him the word “NO”. And with this he knows that with that word he is to cease whatever it is he is doing. Schnauzers are very intelligent dogs and the key to them and any dog is consistence. My dog now understands many words and commands. @ Eve it won’t matter. Most likely they’ll be facing the door and that’s where you begin teaching the “Speak” command. @ Wendy, the way to teach him quiet is all in the blog. Wait them out and reward. Patience game. I’m going to try this. I’ve tried everything with my dog. He’s a 9-1/2 year old, 15 pound Yorkie with a mind of his own. Over his lifetime, he’s been to eight different obedience classes. Nothing has worked. I even tried a suggestion I saw on your show using pennies in an empty water bottle. Nothing has worked. Love, love, love my dog, but the barking bothers me and everyone else (especially the neighbors). many quality tips in this web site. Would like to know how to quiet barking on command… he is small breed . sounds good except my dogs dont bark at the sound of the door bell. But they bark their heads off at every dog & person they see when they are out in the yard. I have three Dogs a Minuter Dachshund a Shih Tzu and a half Shih Tzu and bichon. They bark at the Neighbors and there dogs every time they are in there back yard. What can I do to train them so when there in the back yard they won’t bark? Is it possible to train two young dogs at the same time? I have two 2-year old puggles and teaching them commands is very difficult. I take each outside separately and try to train them, but the minute they are together it’s like I didn’t accomplish anything. I did get them to stay; but only if they knew they would get a treat afterwards. If I don’t have any treat to give them, that command means nothing. They seem to be too smart for their own good or I’m just not as smart as they are. Any suggestions besides permanently separating them? How do I go about this training with 3 dogs? We love your show and watch every week. Thanks so much for all you do in the animal kingdom! is there a recent that you can’t teach the quiet command when they start barking on their own? Why do i need to to teach them to speak first? Brandon, my wife and I love your show and have picked up some great tips on helping to train ourselves as well as our dog. We recently adopted a 1 year old beagle with little to no training. He is really sweet and incredibly quick at picking things up. He has a really good sit, stay, down, come, and gets better with off every day. From our understanding, he was left for long periods of time in a crate/alone in a house. Like most beagles he is very vocal about what he wants and we have broken him of the habit of begging. However, every time we leave the house, even for 5 minutes, he gets anxious and scratches at the door baying and howling frantically. We have tried patiently working with some of the techniques you’ve used on some of the dogs on the lucky dog show (such as ignoring with the door closed, treating when quiet, and increasing the intervals). But we can’t seem to get him past 10 minutes alone, which is problematic when my wife and I have to go to work. We go on long runs in the morning and go hiking in the evening, and when we can we take him to a nearby bark park. Not sure what else to do to help our little buddy. Any tips? I saw on your show that you can use the pennies in a bottle technique to teach the quiet command. Is this a better way? I’ve already started training him with the pennies, so I’m concerned I’m doing it wrong. Another schnauzer owner here and also a mixed breed/rescue dog. We live on 1/2 acre and both of my dogs bolt out the door first thing in the morning and start barking immediately looking for the neighbor’s dog or squirrels. They stop after about 30 seconds, but by then I’m sure the neighbors are up as well as my family. How do I stop this? My dogs bolt out the back door first thing in the morning and bark for about 30 seconds and then stop. By then they have woken up our neighbors as well as my family. I’m sure they are getting their first blast of energy after sleeping in crates all night but it’s fairly early and I’m worried my neighbors will get upset. Then they just chase squirrels and bark at the pool cleaner all day. (mini schnauzer & mutt (rescue – westie/dachshund/jack russell). Sometimes have to close my blinds so they can’t look out the window. Help!! This is such a helpful post for me. Thanks for sharing us. We have a 9 year old papillon who barks at approaching dogs on walks. She not a much of a barker in the house or yard but I cannot make her stop barking at other dogs the minute she sees them on walks. Please help. I HAVE TO try this. My what’s-his-breed rescue boy Winslow is an immediate howler – at strange noises, people (especially kids), other dogs (even far away ones). Then my shihtzu-mix rescue Benji starts in and won’t stop barking (sounds like a big dog)! I’m excited, as they’re both really smart and very food-motivated! Thanks! ©2016 Brandon McMillan Canine Minded. All Rights Reserved.